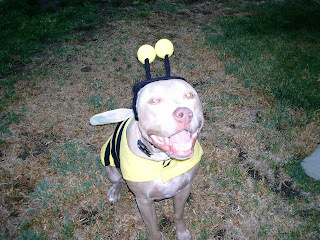 This is Lily in her Bumble Bee costume. Lily has always been a big fan of Halloween because of all the people. She loves to greet. Our house is tucked back off the street so we get very few visitors. Instead, we do an early evening walk with her so she can get pet by lots of kids and adults alike. Costumes don't bother Lily. She's curious, but never scared. People still smell like people, even little people that are dressed like Ninja Turtles or Power Rangers or Avengers. We've been doing the Halloween walk with her for the last 7 years. Still, we pay attention to her body language because we don't ever want to force her into a situation that makes her uncomfortable. As she ages, one thing is becoming evident: noise sensitivity. Loud noises bother her much more than they did as a puppy. We have one street that really gets into the Halloween spirit. To get your treats, you must make it to the front door of each house - through mazes and hazes and flashing lights and loud pops and booming explosions. We stopped taking Lily up this street last year. She had always particularly enjoyed this street because it had her two favorite things: People and TREATS! The mazes didn't bother her (it probably helped that the dog saavy parents had schooled everyone involved in the mazes that we do not jump out at people with their pets; only unsuspecting kids and adults sans dogs) and there were always cookies waiting for her at the door (and usually the ones that mom never allowed because they weren't grain free, thus raising the value of those particular treats). Last year, I noticed that she was no longer the happy-go-lucky girl that usually walked up the street, tail waging and face relaxed. Instead, I glanced down to see her tail tucked. She chose not to go up to the front doors for cookies. We listened to her and quickly curtailed the walk, taking her down a much quieter street - only to see the old Lil return. When everyone thinks of Halloween and pets, they tend to focus on the chocolate aspect of the holiday. Obviously, we have to be extra careful about that - keeping the chocolate up and out of the way so that they cannot get into any of it. But we also have to pay attention to their body language. The 4th of July isn't the only holiday that can be scary for our pets. Each holiday carries it's own dangers beyond food (leftovers at Thanksgiving and Christmas are a concern, but so is a house packed full of people). We can reward our dogs for their loyalty by paying attention to their needs and comfort levels on holidays. 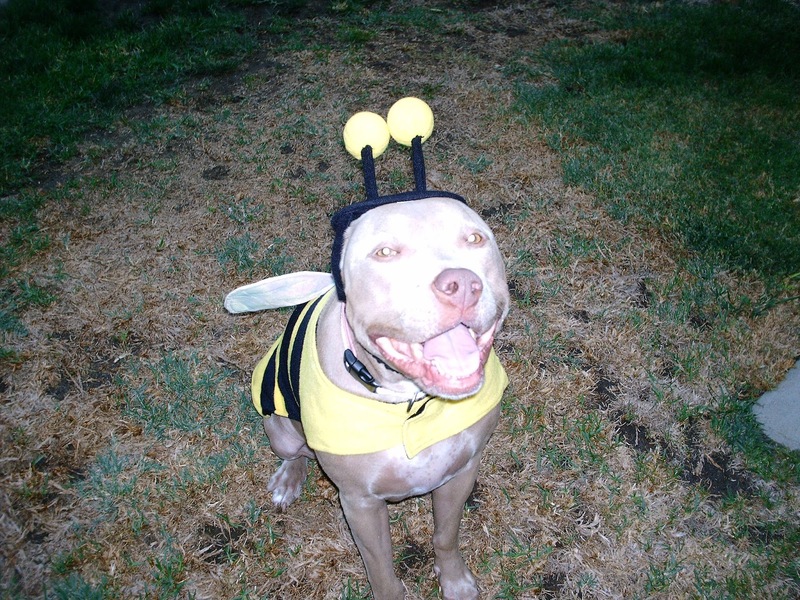 What about you - does your dog like Halloween? Do you dress your pets up for the holiday? Our goal is to encourage people of all ages to pause for a moment and learn about how their actions affect the lives of animals. We are all faced with opportunities to improve the treatment of animals; whether it’s choosing the source we acquire our pets from, the food choices we make, supporting animal legislation, learning to co-exist with wildlife or the types of animal entertainment we support. Paws and Learn was founded in the firm belief that education is the key to encouraging responsible and humane choices affecting animals. Please visit our website here.